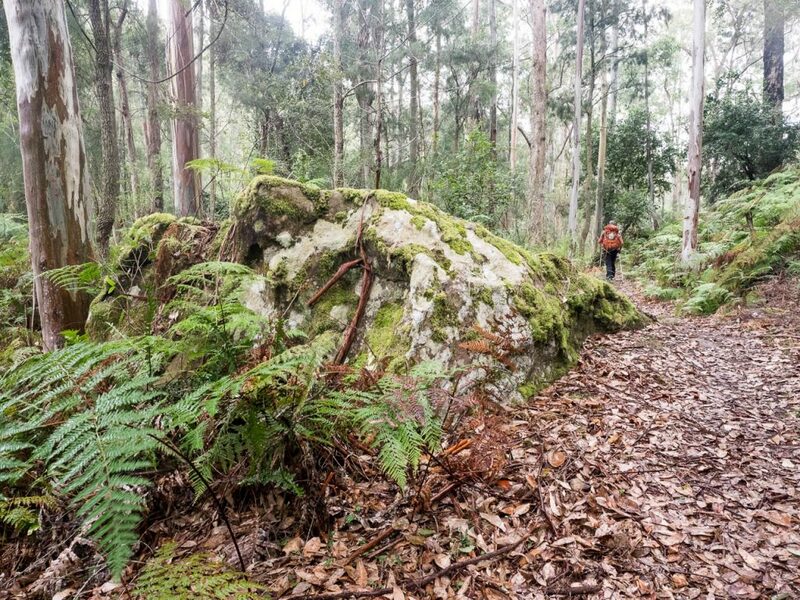 Follow the camber and curve of this section of the Great North Walk to explore Mooney Mooney Creek, wild ridge tops and the rainforest gullies around Somersby. 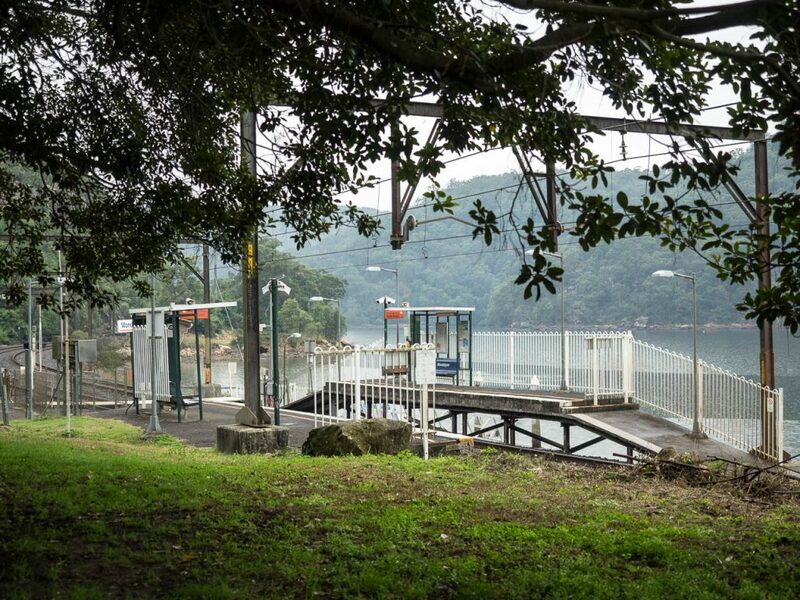 In the heart of the Hawkesbury River’s valleys, gullies and ridges sits the isolated community of Wondabyne. It even has its own tiny train station. I’d ridden past Wondabyne countless times on my way to/from Newcastle, but never stopped there. That all changed when I met my Newcastle friend John for an overnight walk to the township of Somersby, via Mooney Mooney Creek. Wondabyne Train Station: make sure you let the train driver know that you want stop here. The trail ascends steeply from the station, rejoining the GNW track linking Girakool and Patonga. Even though I’ve walked this country before, I was still blown away by the utter sense of remoteness you get from traversing it (even if, sometimes, you can see the F3 in the distance). Banksia sp. ericfolia and spinulosa were both in bloom. After a while we dropped down to Scopas Creek, a pleasant little gully where we had lunch, perched on a rock platform. From there, wet sclerophyll forest leads to Piles Creek, crossed via a suspension bridge, and then onto Mooney Mooney Creek, a wide, peaceful tributary to the Hawkesbury. After crossing the Old Pacific Highway, we followed an almost suburban road along the creek. This section was pretty boring but we marvelled at the massive pylons of the F3’s bridge – a structure I had always driven over without a second thought. Eventually, we started on a bush trail again, still alongside the creek. I wasn’t looking forward to camping on its banks. Thankfully we ended up missing the Mooney Mooney North campsite completely, tricked by the overgrown grass and pestered by mosquitoes and leeches. We only realised this once the creek started to narrow and we walked out onto rocky platforms next to some graceful, wide falls. The beautiful section just after Girakool is one of the walk’s highlights. 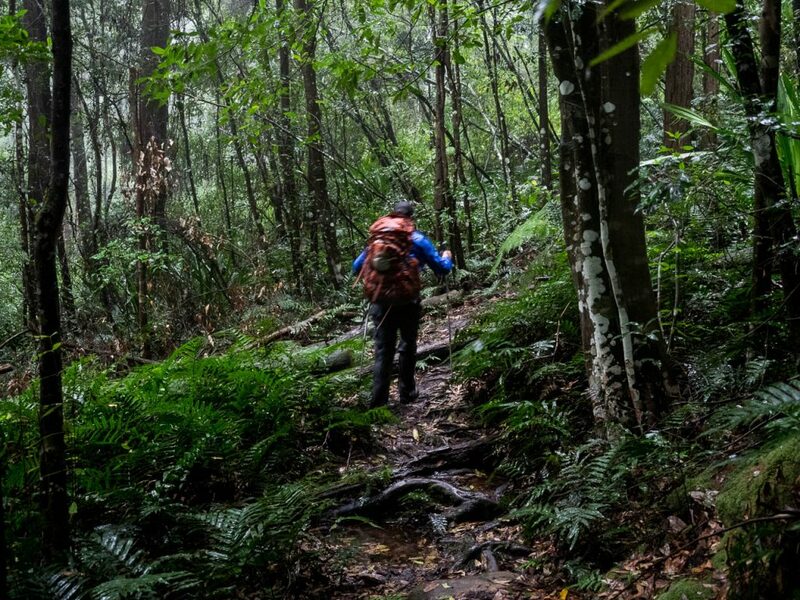 Given the choice of an unknown ridge-top campsite further up or the mosquito-infested hellhole behind us (OK, I exaggerate), we pushed on, up the service trail that rises above Lower Mooney Mooney Dam, into dry, ridge-top woodland. Along the way, we crossed a rainforest gully, speckled by late afternoon light. Here, John noticed a stupendously tall dead tree, its upper reaches colonised by staghorn ferns, fringed gold by sunset. We made it to camp just before dusk – the day had been about 6km longer than planned, 19km in total, so we felt worked. We were, however, chuffed with our decision to press on: the Quarry Camping Area (imaginatively named for a nearby quarry) sat in a quiet forest clearing, with enough space for at least three tents. There was an ephemeral creek a few hundred metres south, which happened to be running (though you should take water from Mooney Mooney). There was also, to my surprise, a few, attentive leeches. 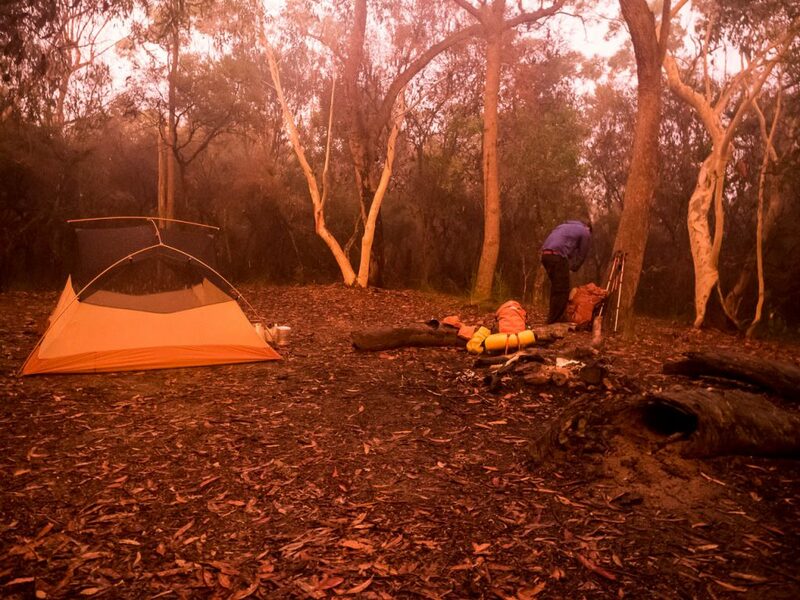 Too late: the rain had already set in by the time we broke camp in an eery red glow. Any hopes we had for a lazy morning around camp were dashed by the first drops of rain at 6am. Distant thunder got us out of bed for a quick breakfast in an otherworldly red glow, the sunrise filtered by storm clouds. It was already raining heavily when we packed up the tent. From camp, we descended through wet forest into secret gullies with peaceful swimming holes – peaceful, that is, except for the torrents of rain breaking their surface. The walk continued through a particularly beguiling rainforest gully. We were totally soaked by the time we reached the fire trail and road bash to Somersby store that marks the end of the walk. I took a few photos while John powered on. I found him picking off leeches off his ankles. I had two to account for (and a hidden third I would discover later at the cafe, affixed to my stomach). We changed into dry clothes and escaped in John’s car (he had parked there the previous day and caught a taxi back to Gosford). All up, not the most spectacular section of the Great North Walk to date but it had its moments: the Quarry campsite is a sweet place to camp for the night (leeches not withstanding) and the walk covers a lot of different ecosystems. 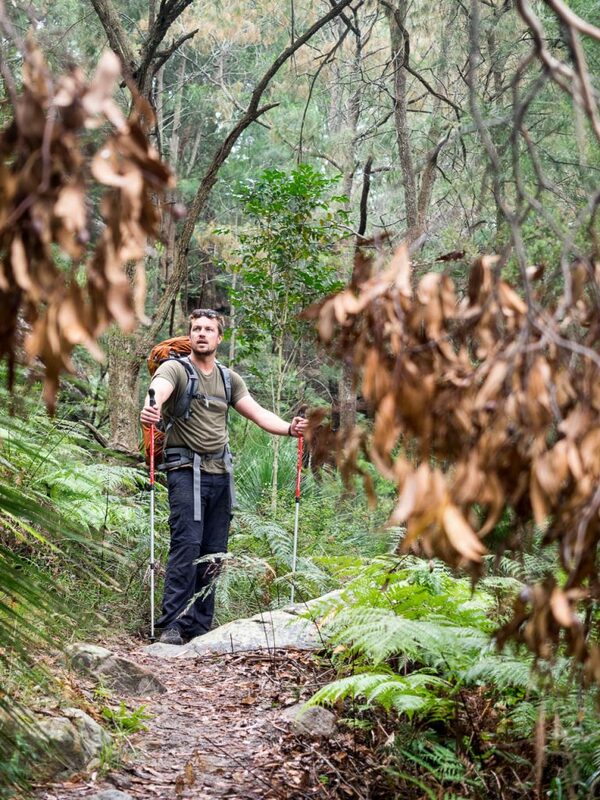 It’s also less taxing than walking through the constant ups and downs of the Berowra Valley. Full track notes at Wild Walks. Nice write up and pics!, have u done anymore of the GNW ? Hi Joe. Love your work! Glad you liked my post too. Hope it was helpful. 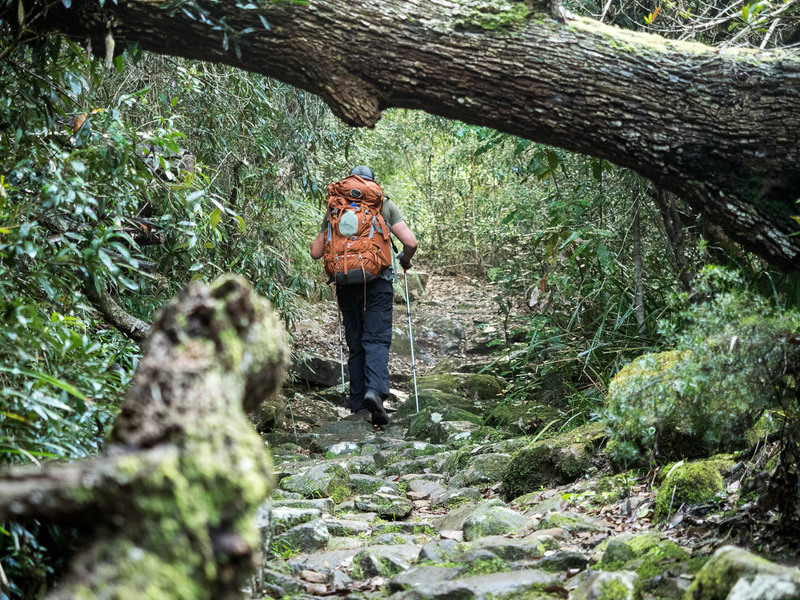 Yes, I’ve done 5 overnight sections of the walk – mainly around Kuring-gai and Brisbane Waters – all of them great and all challenging in their own ways. I’ve got posts up for 4 of them on the blog. Have a read! One day, I’ll link them all up in one push… But day walks sounds like a good plan too. Car shuffles up in the Watagans will be epic, however!